Guess Who's Really Raking In The Health Care Contributions? 5199078As a wild week in Washington draws to a close, chew over these numbers as you head out for the weekend. The Republicans have put up staunch opposition to President Obama's ideas for health care reform. However, it turns out the GOP does not fare as well as Democrats when it comes to soliciting campaign contributions from doctors and other people working in the health sector. A check of contributions from political action committees and individuals who donated $200 or more during the 2007-2008 election cycle finds that Democrats raised a total of $40.9 million compared to $32.1 million that went to Republicans. The numbers were released earlier this spring by the Federal Election Commission. The Center for Responsive Politics, which hosts the statistics defines health professionals as consisting primarily of doctors, though their ranks could also include nurses or other people working in a professional capacity in the health sector. So it was that in 2007-08, the top 100 recipients in the House of Representatives included 54 Democrats and 36 Republicans. 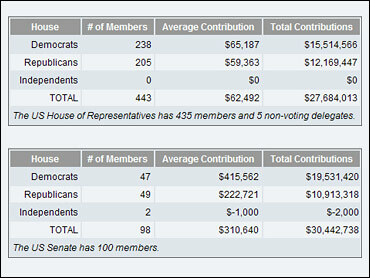 Congressman Ron Paul (R-TX) led the pack with $611,628, compared to No. 2 Frank Pallone, Jr. (D-NJ) at $505,068. The rest of the top ten included Tom Price, (R-GA) Phil Gingrey, (R-GA) Pete Stark, (D-CA) Charles Rangel, (D-NY) Mark Kirk, (R-IL) Mark Udall, (D-CO) John Dingell, (D-MI) and Gordon, Bart (D-TN). Slicing the numbers another way, the 238 House Democrats at the time received $15.5 million in total contributions, while the 205 Republicans got $12.2 million. The 47 Democrats at the time took in a combined $19.5 million while 49 Republicans raised just $10.9 million from health professionals. Then Senator Hillary Clinton (D-NY) raked in more than anyone else in Washington with $3.9 million. For Health Services and HMOs, the split was nearly 2 to 1 in favor of Democrats. The Democratic advantage was more than 2.5 times as great when it came to contributions from hospitals and nursing homes.